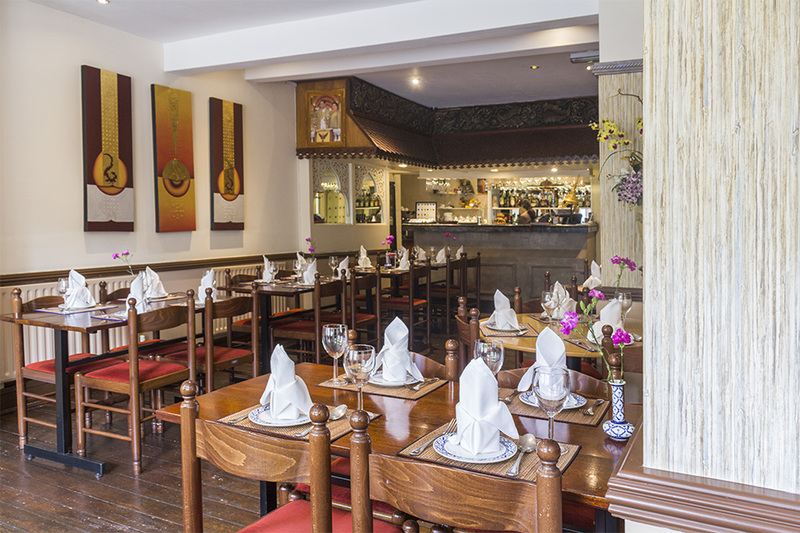 For only £18.95 per person, enjoy a Royal Banquet at the Thai Dusit in Derby! A minimum of 2 people is required to dine on this menu. 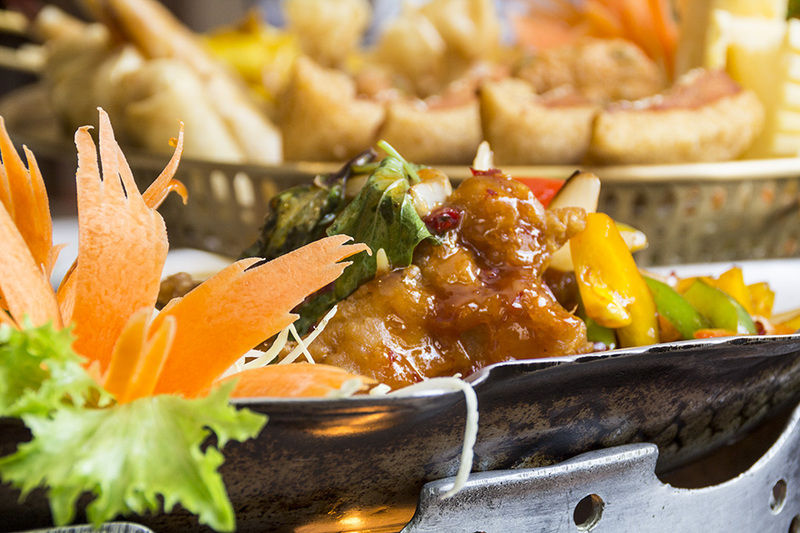 Includes the special Thai Dusit platter to start and a selection of Thai classics to follow! Set Menu B is also available for £23.95 per person, with a minimum of 2 people per banquet. Book online for free text confirmation or call 01332 809 016. For only £19.95 per person dine on a delicious Royal Banquet at the the Thai Dusit (Set Menu C). Starting with the exclusive Thai Dusit platter followed by a large selection of classic Thai dishes. Also available for £24.95 per person (Set Menu D) for 4 people minimum. Book online for free text confirmation or call 01332 809 016. Enjoy a set lunch menu including one starter and main course at Thai Dusit for just £7.95 per person. Booking is advised. Book online for free text confirmation or call 01332 809 016. Enjoy an Express Lunch Menu for just £5.50 per person only at Thai Dusit. Booking is advised. Book online for free text confirmation or call 01332 809 016. 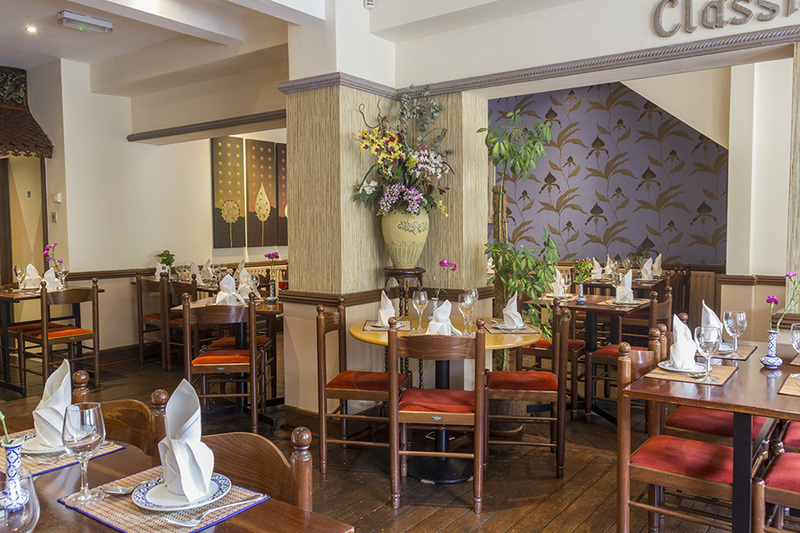 Enjoy a Special Lunch Meal for only £7.50 at Thai Dusit or add a starter for £10.45! Booking is advised. Book online for free text confirmation or call 01332 809 016. Excellent food and a pleasant atmosphere. Service can be a bit slow and it certainly isn't cheap. Had a lovely evening with the family and enjoyed a fab meal, we had the Thai dusit sharing platter starter which was amazing, then all different main dishes we shared out and lovely coconut and egg fried rices. The gin was so tasty and so were the desserts and coffees. Lovely meal with friends at a great venue. Food was great. Very good vegetarian selection. Service was very good and staff were very friendly and helpful. Maybe a little overpriced but would certainly return. Excellent as always we had the set menu for four so much food we couldn’t eat it all, and top quality. Nice atmosphere, food good and great service. Can recommend this family run restaurant without reserve. Food was beautifully presented and very tasty, service was 5 star, definitely book again! Nicest Thai restaurant in Derby. Me and my partner enjoyed the prawn crackers, starters and main. Lovely place. Food out of this world, and big portions. My vegetarian co diners were overjoyed with their meal, and for the first time I saw them clear their plates. Will certainly book again. There were few people when we arrived and service was prompt and fast. Food was good, only gripe was that the curry we ordered was a bit watered down, not the thick massaman that I was used to. Really enjoyed the food. Will definitely be going back. Good food and plenty of it. No problem when I asked for some more rice. Service a little slow. The staff were very friendly and the service impeccable. I need to explore the menu to give an overall 5 star but for what I had it was very tasty. I would go again to try other dishes. We held our staff party here on Friday 16th December. The night was a great success and food served as part of the set meal was fantastic. Hot and varied and well presented. The attentiveness of the staff was excellent. Lovely food, beautiful presentation and very attentive staff at Thai Dusit. Great food and service at Thai Dusit. Would highly recommend! Nice food, reasonable value at Thai Dusit. Food is excellent at Thai Dusit and good service but decor dated and tired. Really nice food and very busy for midweek. Would recommend but try and get the english speaking waitress who smiles more. Portions are really big and served very quickly. The ambience of the restaurant was nice. 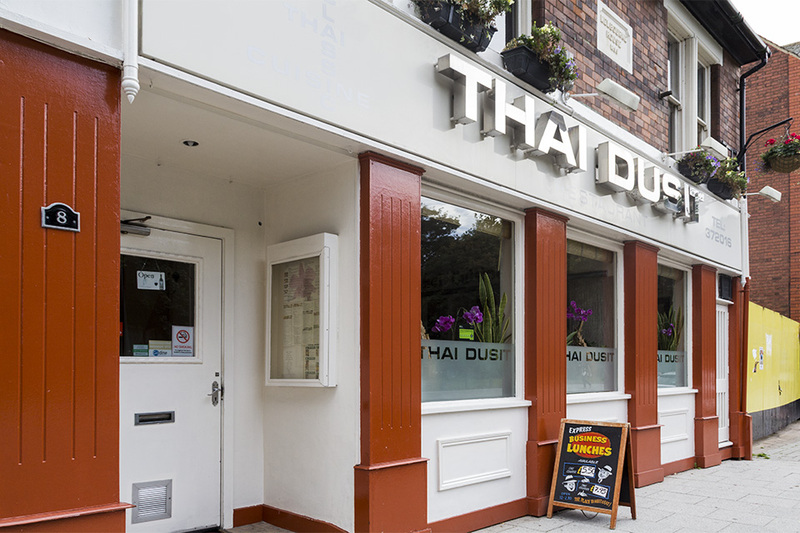 Thai Dusit is situated on Bold Lane, at the end of Sadler Gate and a stone’s throw away from Friar Gate within the classy Cathedral Quarter of the city. It is within walking distance from Derby Cathedral, Derby Museum and Art Gallery and the Guildhall Theatre. It is only a couple of minutes from the main stretch of bars and clubs and is ideally located for a meal before sampling Derby’s nightlife. The restaurant itself is bright and airy and the tables are decorated with pink orchids and skilfully folded serviettes. The room is brightened up with the addition of leafy plants and exotic art work on the walls. The dining room forms a pleasant canvas to enjoy a truly stunning Thai meal. The kitchen serves only the finest and freshest Thai cuisine, cooked and prepared by Thai chefs who have a wealth of experience behind them in creating and presenting beautiful Thai cuisine. The menu contains many classics that even Thai first timers will recognise such as Pad Thai and Thai Green Chicken curry. Diners are, however, recommended to look deeper in to the menu to uncover beautiful dishes such as Ped Nam Deng; stir fried roasted duck with spring onion, black mushrooms and baby corn in a light soya sauce, Pla Sam Rod; deep fried battered fish atop a tamarind sauce with onions and chillies with a slightly sweet taste, and the Chefs’ speciality of Lamb Massaman; a popular dish from Southern Thailand of lamb in a mild peanut curry of Thai herbs with coconut milk, carrots, potatoes and spring onions. Thai Dusit is an extremely well executed restaurant that will please diners with the quality of cuisine and reasonable prices that they are offered at. It is ideal for couples and smaller parties. Traditional Thai hot & sour clear soup flavoured with lemon grass, fresh chillies, lime leaves, galangal & mushroom. Choose prawn, chicken or mushroom. Similar in taste to Tom Yum with a distinct taste of galangal and is a coconut milk based soup. Non spicy clear soup with vegetables. Marinated skewers of chicken grilled & served with a peanut sauce and cucumber salad. Thai golden bags; thin pastry skins filed with minced chicken &, deep fried and served with sweet chilli sauce. Chicken marinated with coriander root, cracked black pepper & oyster sauce wrapped in pandan leaves & deep fried. The original & famous spicy Thai fish cakes. Marinated chicken & prawn on toast deep fried & served with sweet chilli sauce. Deep fried tiger prawn spring rolls served with sweet chilli sauce. Deep fired squid & onions in batter served with sweet chilli sauce. Thai vegetarian spring rolls served with sweet chilli sauce. Barbecue in Thai style of vegetables and bean curd served with peanut sauce. Thai style hot and sour salad of glass noodles, onion, spring onion, coriander, lime juice and mixed seafood. Spicy minced chicken with ground rice, chilli, onion, coriander and lime juice. Stir fried chicken with red wine sauce, carrot, onion, spring, mangetout and on top; golden cashew nuts. Stir fried chicken with fresh ginger, mushrooms, spring onions, onions & peppers. Stir fried chicken with garlic & ground pepper, onion, leek, spring onion & peppers. Stir fried battered chicken, cucumber, pineapple, tomato & onion in Thai style sweet and sour sauce. Stir fried chicken with fresh chillies, Thai basil leaves, bamboo shoots, long bean, onion, peppers & mushroom. Stir fried chicken with 'chef's special sauce', bamboo shoots, onion, spring onions, celery, peppers and mushrooms; flavoured with a chilli oil sauce. chicken roasted to perfection after marinating at length in honey, garlic & coconut milk. Stir fried battered pork, cucumber, pineapple, tomato & onion in Thai style sweet & sour sauce. Stir fried pork with garlic & ground pepper, onion, leek, spring onion & pepper. Stir fried pork with fresh ginger, mushroom, spring onion, onion, & peppers. stir fried pork with fresh chillies, Thai basil leaves, bamboo shoots, long bean, onion, peppers and mushroom. Stir fried pork with 'chef's special sauce', bambook shoots, onion, spring onions, celery, peppers, mushrooms & flavoured with chilli oil sauce. Stir fried tender beef strips in oyster sauce with mushrooms, carrots, broccoli and cauliflower. Stir fried beef with red wine sauce, carrots, onions, spring onions and mangetout with golden cashew nuts on top. Stir fried beef with fresh chillies, Thai basil leaves, bamboo shoots, long beans, onions, peppers and mushrooms. Stir fried beef with 'chef's special sauce', bamboo shoots, onions, spring onions, celery, peppers, mushrooms & flavoured with chilli oil sauce. Slices of roast duck stir fried with fresh ginger, mushrooms, onions, spring onions & peppers. Stir fried roasted duck with spring onions, black mushrooms & baby corn in a light soya sauce. Stir fried duck with 'chef's special sauce', bamboo shoots, onions, spring onions, celery, peppers, mushrooms & flavoured with chilli oil sauce. Grilled jumbo prawns topped with a dry aromatic red curry in coconut milk. A delicious red curry in coconut milk made with roasted duck slices, pineapple & vegetables. A famous red curry in coconut milk with seasonal vegetables and your choice of chicken or beef. A famous green curry in coconut milk with seasonal vegetables with your choice of chicken or beef. A famous green curry in coconut milk with mixed seafood and seasonal vegetables. A popular dish from the southern part of Thailand. Thai herbs & chicken in a mild peanut curry with coconut milk and potatoes. A dry aromatic curry with coconut milk and lime leaves with chicken. A spicy hot jungle curry with chicken, Thai herbs and vegetables. Stir fried king prawns, cucumber, pineapple, tomatoes & onions in a Thai style sweet and sour sauce. King prawns with garlic & ground pepper, onions, leeks, spring onions and peppers. Stir fried battered king prawns in tamarind sauce with peppers, onions, carrots and golden cashew nuts on top. Stir fried king prawns with fresh chillies, Thai basil leaves, bamboo shoots, long beans, onions, peppers and mushrooms. Deep fried battered fish on top of tamarind sauce, onions and chillies. A very nice, slightly sweet taste. Battered fish with spring onion, ginger, black mushrooms and baby corn in a light soya sauce. Stir fried squid with garlic & ground pepper, onions leeks, spring onions & peppers. Stir fried squid with fresh chillies, Thai basil leaves, bamboo shoots, long beans, onions, peppers and mushrooms. Duck marinated in traditional Thai spices and then grilled over charcoal. Served in a hot pan. Deep fried battered fish topped with spicy Thai herbs & coconut milk. Stir fried mixed seafood with fresh Thai herbs & fresh basil leaves. A popular dish from the south of Thailand. Lamb in a mild peanut curry and Thai herbs with coconut milk, carrots, potatoes and spring onions. Stir fried lamb with 'chef's special sauce', bamboo shoots, onions, spring onions, celery, peppers, mushrooms & flavoured with chilli oil sauce. Special fried rice with egg, mixed meats and prawns. 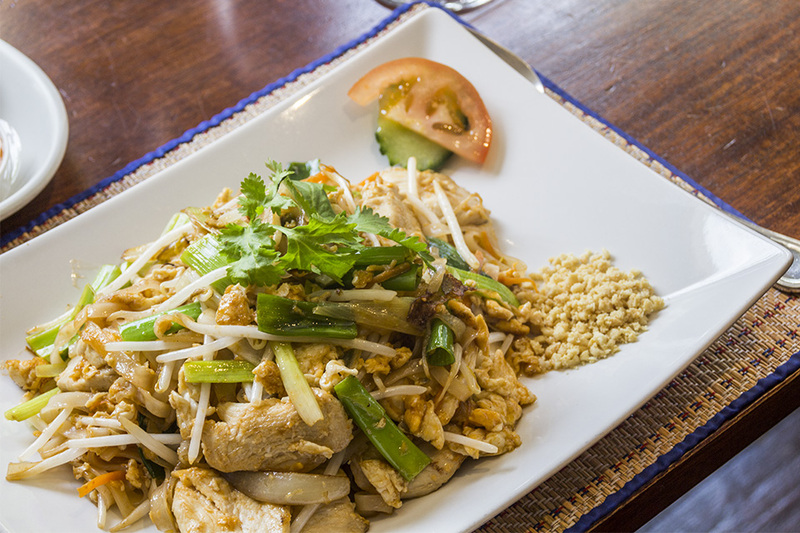 A classic Thai noodle dish with chicken and egg topped with ground peanuts. Stir fried noodles with vegetables & egg in soya sauce. Stir fried mushrooms, onions, spring onions, carrots and peppers topped with golden cashew nuts. Stir fried mushrooms & bean curd with fresh chillies, Thai basil leaves, bamboo shoots, long beans, onions and peppers. 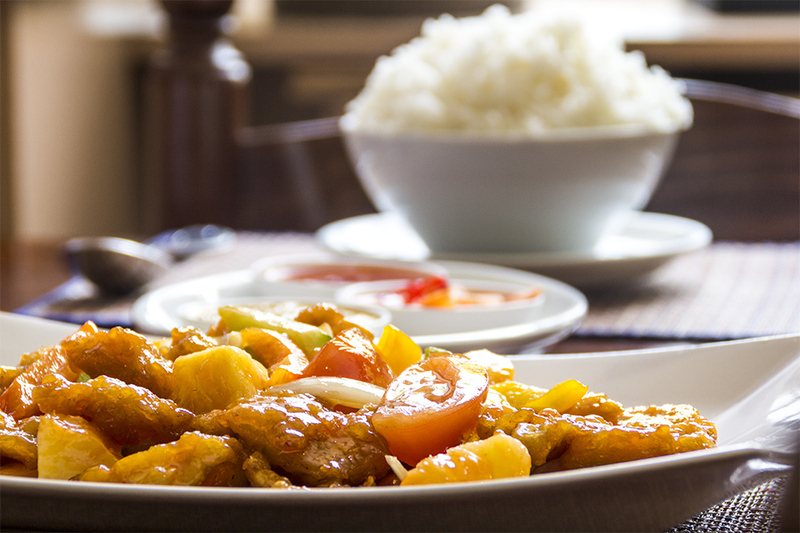 Stir fried battered bean curd, cucumber, pineapple, tomatoes and onions in a Thai style sweet and sour sauce. Deep fried battered aubergine with 'chef's special sauces'. Slightly hot with a sweet taste from the tamarind sauce. Thai red curry with vegetables in coconut milk. That green curry in coconut milk with mixed seasonal vegetables. Bean curd, potatoes and carrots in a mild peanut curry with coconut milk. Hot jungle curry with Thai herbs and vegetables. Stir fried vegetables, cucumber, pineapple, tomato and onions in a Thai style sweet and sour sauce. A tangy lemon sorbet crammed into a whole lemon. Thai Dusit pancake roll stuffed with coconut and served with ice cream. Half a coconut filled with coconut ice cream. Thai Dusit custard baked and served with vanilla ice cream. 3 scoops of your desired flavour; vanilla, strawberry, chocolate. A bombe of chocolate ice cream with a liquid centre and covered in a crispy nutty coating. Banana fritter fried in butter and served with ice cream. A whole fruit scooped out and filled with a flavour orange sorbet. Choose one starter and one main from the following menu. Traditional Thai hot and sour clear soup flavoured with lemon grass, fresh chillies, lime leaves, galangal and mushrooms. Choose from chicken, prawn or mushrooms. Minced chicken and prawns on toast, deep fried and served with sweet chilli sauce. Deep fried chicken wings in Thai style red wine sauce. Deep-fried battered squid & onion, served with sweet chilli sauce. Thai vegetable spring rolls served with sweet chilli sauce. Deep fried vegetables in batter, served with sweet chilli sauce. Sweetcorn cakes blended together with flour and fragrant Thai spice, deep fried and served sweet chilli sauce. Deep fried crispy vegetable wontons, served with sweet chilli sauce. A classic thai noodle on top of ground peanut. your choice of chicken or bean curd. Stir fried egg noodles with chicken. Traditional Thai hot & sour clear soup flavoured with lemon grass, fresh chillies, lime leaves, galangal & mushroom. Your choice of prawn, chicken or only mushroom. Marinated skewers of chicken grilled & served with peanut sauce and cucumber salad. Thai golden bags; thin pastry skins filled with minced chicken & prawn, deep fried and served with sweet chilli sauce. Deep fried squid & onions in batter served with sweet chilli sauce. Deep fried crispy vegetables wontons, served with sweet chilli sauce. All served with your choice of steamed fragrant rice or egg fried rice. Stir-fried duck with 'Chef's special sauce - flavour of chilli oil sauce' with bamboo shoots, spring onions, celery, onions, peppers & mushrooms. Stir-fried with onion, chilli, sweet basil leaves and tamarind sauce with a slightly sweet taste. Your choice of prawns, fish or squid. Famous Thai green curry in coconut milk with prawns and seasonal vegetables. Boneless fish in light batter topped with a spicy Thai herb & coconut milk sauce. 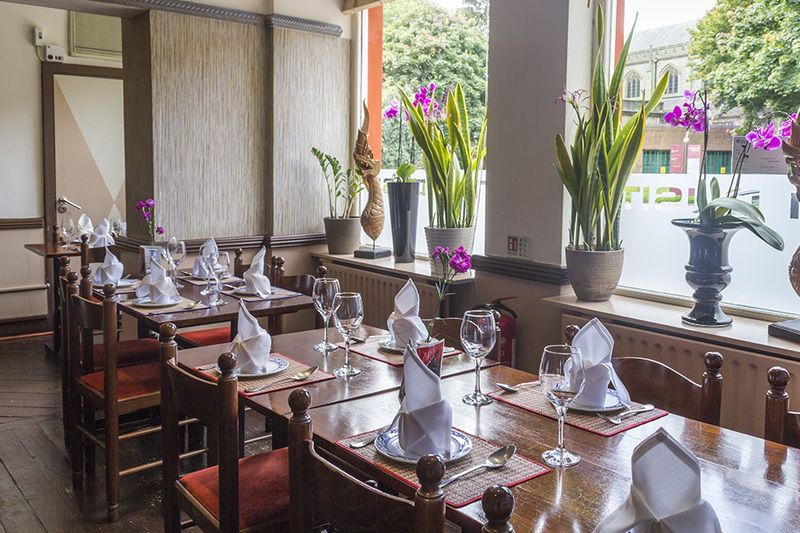 For only £18.95 per person, enjoy a Royal Banquet at the Thai Dusit in Derby! A minimum of 2 people is required to dine on this menu. 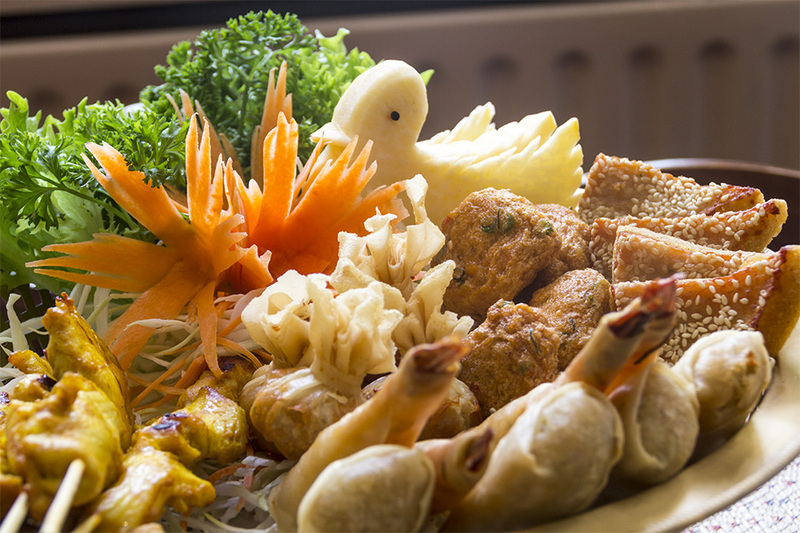 Includes the special Thai Dusit platter to start and a selection of Thai classics to follow! Set Menu B is also available for £23.95 per person, with a minimum of 2 people per banquet. 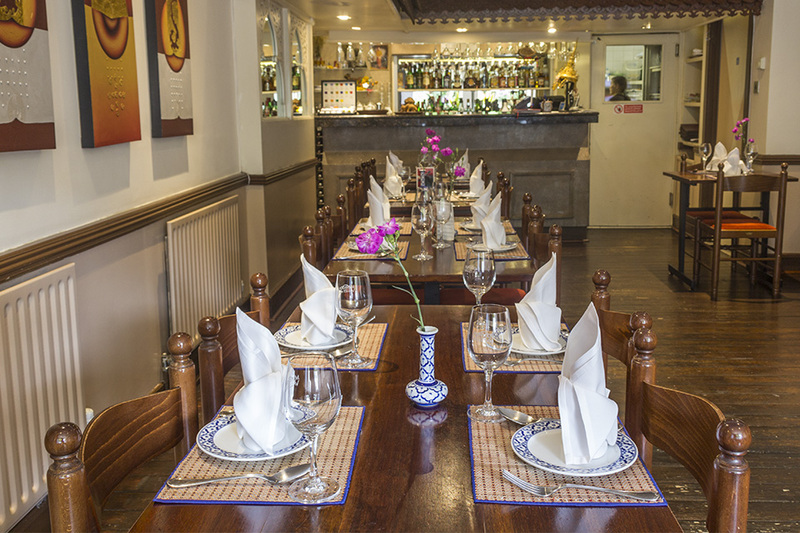 For only £19.95 per person dine on a delicious Royal Banquet at the the Thai Dusit (Set Menu C). Starting with the exclusive Thai Dusit platter followed by a large selection of classic Thai dishes. Also available for £24.95 per person (Set Menu D) for 4 people minimum. Enjoy a set lunch menu including one starter and main course at Thai Dusit for just £7.95 per person. Booking is advised. Enjoy an Express Lunch Menu for just £5.50 per person only at Thai Dusit. Booking is advised. Enjoy a Special Lunch Meal for only £7.50 at Thai Dusit or add a starter for £10.45! Booking is advised.